To Live (and Eat, Sleep, Shop) in L.A. In preparation for the L.A. Issue, Adweek sent a team of editors and producers to Hollywood to research the agencies and brands that are making the West Coast one of the hottest places on Earth for melding media, technology and marketing. In the course of our meetings with top agency execs, brand marketers, television producers, talent reps—and yes, at least one celebrity—we took the pulse of the city and the boldface brands that are making it tick. Here's a tour of some of our favorite companies that are heating up Los Angeles, with a smattering of recommendations for our fellow westbound travelers. JetBlue’s new premium-class service Mint offers coast-to-coast travelers flatbeds, early boarding, free WiFi, items from New York restaurant Saxon + Parole and Blue Marble ice cream. Pro tip: Don’t miss the Birchbox-curated amenity kits. Experience L.A.’s car culture to the fullest with a most coveted set of wheels. Enterprise’s Exotic Car Collection and Hertz’s Dream Cars each offer the environmentally friendly Tesla Model S electric sedan, starting at $375 per day. Pro tip: Members and guests of Soho House West Hollywood will have special access in the coming months to the new compact electric BMW i3 at the members-only club’s locations worldwide. If room service and valet parking aren’t your thing, leave the city’s luxury and boutique hotels behind for a homier experience via Airbnb. We found everything from a four-bedroom modern stunner with an infinity pool in Beverly Hills ($1,995 per night) to this more modest master suite in Venice Beach ($135 per night), which happens to be in the former MTV Real World house and hosted by a former advertising exec. With an underground tunnel to CAA’s headquarters, don’t be surprised if you find the dining room at Hinoki & The Bird filled with any number of highly talented talent managers. The menu’s good, too (pictured: Drunken Duck Breast). Pro tip: Ask to sample the chef’s daily selection of cold-pressed juices. For the ultimate power meeting spot, call on Dimitri Dimitrov, maitre d’ at The Tower Bar at the Sunset Tower Hotel. Hollywood’s version of New York’s The Lambs Club, it’s a favorite of stars and starlets seeking refuge just beyond the spotlight’s reach. Spanish-language TV network Univision expands its brand footprint with this foray into retail. Part of the overhaul of LAX’s Terminal 2, the branded shops will combine Univision’s content with snacks, media and Latin American products. Pro tip: Look for specialty items such as candies from Mexico and Argentina. 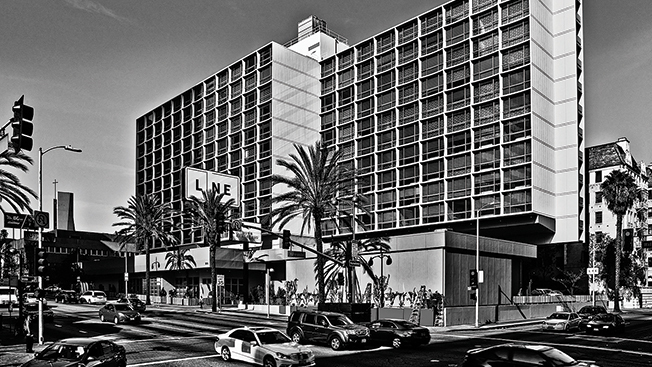 Koreatown’s hottest hangout is The Line Hotel. With an industrial vibe, it’s as if developers the Sydell Group took a slice of Brooklyn and gave it an L.A. touch. Highlights include chef Roy Choi’s restaurants Pot and Commissary and a highly curated shop by art and design collective Poketo. With IAC’s headquarters right down the street, Eveleigh is a popular dining spot among the interactive company’s execs and clients (some local ones include Electus, Match, Tinder and Vimeo). Pro tip: Ask to be seated on the back patio with its open ceiling and splurge on the decadent rib eye. Budget- and style-friendly Japanese clothier Uniqlo made its much-hyped debut in Los Angeles at The Beverly Center in October, complete with celebrity guests Jaime King, Chrissy Teigen and Natasha Lyonne. Pro tip: Our personal shopper tells us the massive store carries items from Disney’s Project Sweat partnership with the retailer. Book Soup has a well-stocked and eclectic newsstand where one can peruse the latest issues of everything from the trades (including our sibling, The Hollywood Reporter) to hard-to-find glossies. We also like Robert Landau’s cool photo book Rock ’n’ Roll Billboards of the Sunset Strip. Advice for travelers from Marcus Clark, Adweek’s go-to stylist in L.A.: “Maximize on your accessories and minimize with packing clothing. Angelinos are known for their laid-back, easy-breezy style sense, mixed with casual and colorful statement pieces.” Clark recommends a versatile blazer (from Moods of Norway on Melrose) and hats and shades for sunblocking. Pro tip: Check out ShopLeLook.com (launching this month) from Vanessa Simmons, host of Lifetime’s tween spinoff Project Runway: Threads (and daughter of past Adweek Brand Visionary Russell Simmons). Your next Amazon Prime package in Los Angeles might arrive as quickly as your last Seamless order. The e-commerce giant is testing a partnership with cab-hailing app Flywheel to bring select orders to your door via taxi. The fare? Five bucks per package. After you’ve wrapped your last business meeting, return to New York on a Virgin America red-eye. The cabin’s mood lighting facilitates relaxation, and the on-demand food and beverage service lets you to sleep easy knowing you won’t miss the drinks cart while your eyes are closed. Pro tip: Don’t miss Virgin’s viral in-flight safety video (10 million YouTube views) featuring So You Think You Can Dance alums, choreography by Jamal Sims and Christopher Scott, and a song written and performed by American Idol’s Todrick Hall.